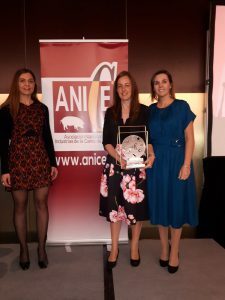 The National Association of Meat Industries of Spain (ANICE) held its annual awards ceremony on March 28, 2019 in Madrid. This is the fourth year the ANICE awards have been conferred upon individuals, companies and institutions that have contributed to the advancement of the meat industry, both nationally and internationally. OSI Spain was awarded the 2019 Sustainability and Environment prize. The Sustainability and Environment prize consists of a recognition plaque and diploma, and is given to those entities with exemplary contributions to a more sustainable meat value chain. OSI implemented a contract for sustainability commitment in all its European plants in 2014, and this contract must be signed and maintained by each plant manager every twelve months. The contract defines objectives that each of the sustainability areas must cover: energy efficiency, efficiency in water consumption and waste management, training and development, commitment to the community, safety and health, animal welfare and supplier auditing. OSI Food Solutions Spain is the second company in Spain’s meat sector and fourth in the country’s overall food sector to have been certified to Social Accountability International’s SA8000® standard.